Leonard Eto is one of the world’s most influential and innovative taiko players. 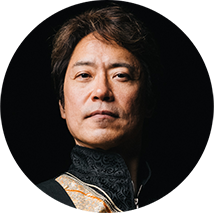 His creativity and vision has deeply molded the way taiko is performed and perceived. Leonard is known for the fluid dance like quality of his movements and the immense joy in his playing. The son of prominent koto player Kimio Eto, Leonard was deeply influenced by his father’s example of expanding the musical possibilities of a traditional instrument. In 1984, Leonard joined KODO and soon became the principal performer, musical director and composer. His compositions for KODO: “Lion,” “Irodori” and “Zoku” propelled the group to new artistic heights. He is the creator of the modern katsugi style of playing, slinging the instrument over the shoulder so that the player could walk and dance while playing the drum. In 1992, Leonard left KODO to pursue a solo career and has collaborated with many great artists ranging from Bob Dylan, Bon Jovi, The Chieftains, INXS, Ray Cooper, and Roger Taylor to world music superstars Zakir Hussain and Doudou Ndiaye Rose. His original compositions have been featured in films such as ‘JFK’, ‘The Lion King’, ‘The Hunted’ and ‘The Thin Red Line’. His compositions have also been featured in performances by master ballet dancers Nina Ananiashvili and Patrick Dupond, figure skater Elvis Stojko and renowned modern dance company Pilobolus. Find more information at leoeto.com.